Designed by and for real travelers, our property is placed in the centre of Seville , in the heart of the city, exactly in Santa Catalina district, a few steps from the main tourist attractions of the city, taking the Giralda and the Santa Cruz district unless than 10 minute walking. The nightlife lovers are also in luck, as Property Baco Suites is located within walking distance of the most 'cool' areas of the nightlife areas. On the other hand, the main shopping areas are surrounding this wonderful property, so fans of the new fashion trends have in this property the perfect vantage point for the coming and going of their purchases. The best bars and restaurants of the city are near the property, from the little bars with a big variety of our rich and famous tapas dishes to the most exclusive restaurants. In Property Baco Suites you'll enjoy a really relaxed atmosphere, and our friendly staff will be happy to help you with any needs you may have, in all matters relating to our facilities and services and in any additional information you can need about our city. Our main goal is to make your stay in Seville a really unforgettable experience, and we will give our best advice about what to do each day, about free events and places to go ...just have to ask us! Our services and facilities are another of our strengths: the 25 rooms have a private bathroom with bath and/or shower, air conditioning, free Wi-Fi, cable TV .. leaves berths for your friends and come to Property Baco Suites to rest on a heavenly bed ! Relax or create your own meals in our spacious sun terrace, equipped with a full kitchen, deck chairs, and everything needed for a complete relaxation. 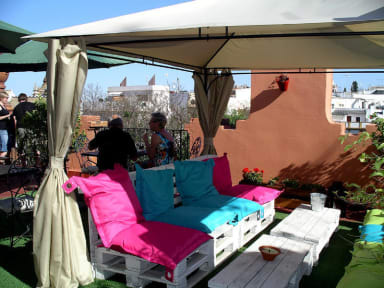 In Property Baco Suites we also have a wide range of additional economic tours and activities in the city (tapas tours, free walking tours, shows, etc..), And we offer the opportunity to enjoy the private pool terraces in the rest of our properties in Seville, where we also use to to plan an interesting program of events, from the best local DJ music mixes, to the most pure flamenco. Se cargara el 25% de la estancia en el momento de la reserva. 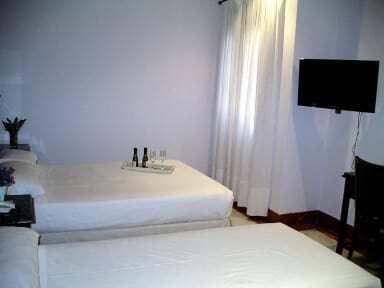 Please, take note our QUAD rooms are 4 people room with 2 king size beds. Private bathroom.